The decision by Fitch, one of the three leading ratings agencies, to downgrade Spain’s government debt to below AAA status is another manifestation of the deadly sovereign debt contagion that has becoming increasingly virulent since Greece’s public finances imploded. What was once a Greek debt crisis that Eurozone politicians were confident could be contained has now contaminated the entire fiscal edifice of the European Union. As a further sign of the deteriorating economic and financial situation in Spain, a growing number of Spanish banks are facing insolvency. There is an attempt by the government and central bank to arrange a shotgun marriage that will consolidate dozens of regional banks that are in fragile condition. This comes on the heels of a major austerity package enacted by the Spanish government headed by Prime Minister José Luis Rodríguez Zapatero, which was approved by the national parliament by a single vote. 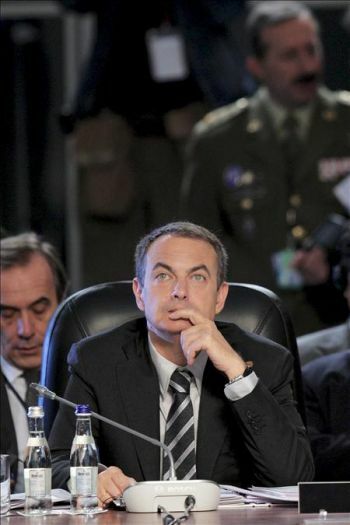 This illustrates the fragility of the Zapatero government, at a times when further economic and financial shocks are likely, on top of a labor revolt against the austerity measures, similar to what is occurring in Greece. The worsening news emerging from Greece, Portugal and now Spain are mere markers on a path leading to a profound sovereign debt crisis that will afflict not only the Eurozone and UK economies, but eventually Japan and the United States. The trillion dollar Eurozone rescue package may have been as recent as almost yesterday, but it is already being forgotten and discarded by investors across the globe, as equity markets tank and financial volatility indexes embark on a steep ascent. It is quite clear that what began as a Greek debt crisis has now morphed into a full-fury European debt crisis. We are in a most precarious phase of the ongoing global economic crisis. It is inevitable that the European debt crisis will spread to the United States, ushering in a dangerous global sovereign debt crisis. Despite the reassuring words of politicians throughout Europe, including Angela Merkel and Nicolas Sarkozy, as well as their counterparts in the U.S.A., this is a train wreck that cannot be prevented, and will transform a financial crisis and severe recession into a synchronized global depression. While bankrupt Eurozone nations are forced to sink deeper in debt to bailout Greece and other countries using the euro that are in even worse fiscal difficulty, a similar absurdity is becoming ever more likely in America. The virtually insolvent U.S. federal government may be forced, sooner rather than later, to bailout its most populous state. California is fast descending into a fiscal sinkhole, with no resolution in site. In 2009, California “solved” its massive $26.3 billion state budget deficit through a combination of budgetary cuts and accounting gimmicks and other games, the only “solution” offered by Governor Arnold Schwarzenegger and the dysfunctional state legislature. In 2010, California’s fiscal woes are back with a vengeance. Even after the budget cuts of 2009, the state is now faced with a $19 billion deficit. While contemplating savage cuts in public services, the state is faced with the absurdity of being compelled to add another $600 million to its extravagant pension program for its public workers. The state employees pension fund lost more than $55 billion during the financial implosion that erupted in the fall of 2008, and expects California taxpayers to make up for the shortfall. At some point, California will be unable to borrow funds at sustainable rates, replicating the ordeal Greece recently endured. At that point, it is likely that a California delegation will be speeding on its way to Washington DC, demanding that all the taxpayers in the other 49 states assume responsibility for bailing out Sacramento. The problem with this stratagem is that most of America’s states are facing immense fiscal challenges. How do in fact the bankrupt bailout the insolvent? In the near future, this will become a far from academic exercise confronting policymakers in Washington. The political masters of the Eurozone delivered their promised “shock and awe” just before Monday’s Asian financial markets opened. If the intention was to create a 24 hour surge in equity prices across the globe, the politicians’ desperate bid to “defend the euro at any price” achieved their transitory objective, at the cost of nearly $1 trillion. However, it is already becoming clear to investors and analysts globally that this trillion dollar joint Eurozone-IMF boondoggle will utterly fail. Already, the euro has given up almost all of its 24 hour euphoric gains, and is resuming its downward descent. It is also increasingly clear that key decision makers within the Eurozone played fast and loose with the EMU constitution, by invoking the “exceptional circumstances” clause of Article 122 of the Lisbon Treaty governing the European Monetary Union. More problematic, it is becoming undeniably obvious that the supposedly independent European Central Bank took orders from the politicians, especially President Sarkozy of France. The ECB president, Jean-Claude Trichet, protests that there was no political interference in the ECB’s decision to start purchasing worthless government bonds from Greece, Portugal and the other insolvent nations that make up the so-called PIIGS. No one believes Jean-Claude Trichet, and Germany in particular will become increasingly alienated from the Eurozone as the ECB engages in the once forbidden monetary sin of quantitative easing. At the price of one trillion dollars, the Eurozone has just paid the first instalment in what may prove to be the most costly funeral for a currency in modern financial history. The doomsday events now unfolding in the Eurozone are in line with the prediction in my book, GLOBAL ECONOMIC FORECAST 2010-2015: RECESSION INTO DEPRESSION (available from the homepage of this website, and on Amazon.com in hard copy or Kindle download). My forecast is that a profound sovereign debt crisis will mark a far more dangerous phase in the global economic crisis, sparking a synchronized global depression. This weekend, the Eurozone political leaders and the European Central Bank are conducting emergency consultations, boasting that they will unleash some sort of “surprise” by the time Monday financial markets are open. When politicians such as Nicolas Sarkozy, president of France, boasts about taking on the speculators while the fiscal edifice of Europe crumbles beneath their feet, I am not exactly reassured that these politicos know what they are doing, or comprehend the turbulent economic and financial forces that have been unleashed by their reckless fiscal mismanagement. Beware, this is not a European problem. It is merely another marker of a profound systemic crisis afflicting the entire global economy. The sovereign debt crisis may be emerging with radical force in the Eurozone first, however the UK, Japan and the United States are the next dominos that will ultimately fall as destructive financial and economic forces beyond today’s clique of mediocre politicians capacity to control let alone comprehend gain velocity. With the markets giving the proverbial “thumbs down” to the deficit-financed Eurozone/IMF bailout of insolvent Greece, the value of the once might euro in relation to a basket of key currencies is sinking at warp speed. It is quite clear that the Eurozone bailout is a panicked-induced attempt to save the euro from its own contradictions. However, it is a futile attempt that is doomed to failure, in my view. A monetary union involving 16 vastly different economies with asymmetrical fiscal policies is nonsensical in the extreme. A common currency may have made sense for a limited number of major European economies, however the current matrix is unsustainable, despite the willingness of European politicians to bankrupt their citizens in a fool’s errand attempt to save what is doomed. Greece is now convulsed in social unrest, an entirely predictable outcome that is bound to get more serious as the full severity of the IMF and Eurozone austerity measures take full affect on the Greek workers and taxpayers. Supposedly this is all being done to prevent a contagion from infecting other European economies with high deficit to GDP ratios. The painful reality is that the pandemic is already beyond the borders of Greece. It will ultimately savage every nation-state existing in a neo-Keynesian fantasy of infinitely-expanding sovereign debt. This includes not only the Eurozone, but also the UK, Japan and ultimately the United States. Greece is a window into the next phase of the global economic crisis. The euro may very well be an early casualty of what is unfolding into the deepest systemic crisis of modern capitalism since the Great Depression of the 1930s. First it was the supposed citadel of free market capitalism, the United States, insisting that its beleaguered taxpayers must bailout the private sector Wall Street firms and banks, despite the nation’s public finances being deeply in the red. Now, in macabre replication, all the nations that comprise the European monetary union and employ the euro as their common currency must bailout Greece, now threatened with national insolvency . The concept of moral hazard is therefore confined to the trash heap of history, as it was already disposed of in the U.S. When the European monetary union was instituted, member states had to guarantee that their annual fiscal deficits would not exceed 3% of GDP. There is also a no-bailout clause in the Eurozone agreement, the implication being that nations utilizing the euro would establish the gold standard for fiscal prudence. Well, we have all witnessed what happened to that supposed gold standard. Successive Greek governments lied about the country’s fiscal problems, and with the help of outside Wall Street “consulting,” constructed stratagems to make it appear that the Eurozone deficit stipulations were being adhered to, when in fact Athens was drowning in a sea of fiscal debt. Even today, it is not known for sure how bad the annual Greek government deficit is, but most recent estimates put it at 14% of GDP, a figure so far in excess of the 3% Eurozone stipulation that it boggles the mind that European taxpayers are being told by their politicians and the IMF that they should trust the politicos in Athens when they proclaim that their new austerity measures will magically shrink the Greek deficit to the required 3% in only a few years-though the estimate of when that event will occur keeps being pushed back. In addition, most financial observers concur that the savage austerity plans hatched in Athens and Brussels with the IMF and Eurozone, will condemn the Greek economy to a prolonged and severe recession, making a mockery of claims that future economic growth will eventually improve the Greek fiscal imbalance. In reality, Greece is insolvent, a point that Professor Nouriel Roubini has recently elaborated on, with a warning that a bailout that does not recognize that the nation is bankrupt will waste an enormous amount of public money. Even more surreal, the very nations being asked to bailout Greece are themselves in deficit, in some cases having a national debt and yearly deficit to GDP ratio as bad as that which brought down Greece’s public finances. Several of the countries that will be contributing public money to prop up Greece are on everyone’s hit list of the next Eurozone nations to be the target of the unfolding sovereign debt crisis and bond vigilantes. These include Portugal, Spain, Ireland and Italy. We may soon witness the absurdity of nations that are experiencing their own debt crisis but must borrow additional money to bailout Greece, only to soon be in the same predicament as Athens, joining Greece in begging the IMF and their fellow Europeans to grant them a bailout. Throughout the unfolding Greek debt crisis, politicians in Europe have sought to pretend that the problem was only one of jittery markets, and things would return to normal. Before pleading for a financial lifeline of $146 billion from the IMF and Eurozone, Greek Prime Minister Papandreou gave numerous assurances that his country would not need a bailout. Now we are being told that countries that are themselves suffering various levels of debt problems should add the massive costs of a Greek bailout to their sovereign credit cards, and somehow this will all work out. I just don’t see the logic of asking a terminally ill patient to provide a blood transfusion to a corpse.